A bit of a change from your typical chocolate chip type muffin, these delicious cinnamon muffins are filled with tasty cinnamon chips. Preheat oven to 375 degrees F/190 degrees C. Lightly grease 8 to 12 muffin cups with nonstick cooking spray or vegetable oil (paper baking cups may be used, if desired). In a medium bowl, combine flour, baking powder, salt and cinnamon. Mix well. Set aside. Melt butter and let cool slightly for 3 to 5 minutes. Pour cooled butter into a large mixing bowl. Whisk in milk, sugar, egg and vanilla; add flour mixture and cinnamon chips, mixing only until all ingredients are thoroughly combined (batter will be lumpy, that's alright). Spoon batter evenly into muffin cups about two-thirds of the way full. 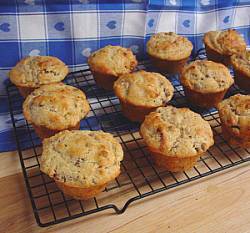 Bake in preheated oven for 15 to 18 minutes, or until a toothpick inserted in the center of a muffin comes out clean. Remove from oven and transfer to wire rack to cool slightly before serving. Cinnamon chips can be found on the baking aisle next to the chocolate chips, etc. in your local supermarket. Hershey's makes cinnamon chips and there are other brands that make them also. King Arthur Flour carries a 1 pound bag (3 cups) of Cinnamon Flav-R-Bites® that would work well in this recipe. Their web address is: www.kingarthurflour.com. I made these last night and I have had better muffins -- try the Oreo Muffins, they are terrific; but the Cinnamon Chip muffins tasted like it had too much baking powder in the dough.